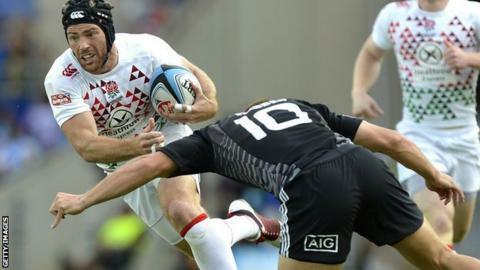 Leeds Carnegie have re-signed England Sevens captain Rob Vickerman on an 18-month contract. The 28-year-old centre made 53 appearances for the Headingley side before joining Newcastle in 2009. He could be included in Carnegie's squad for the game against Nottingham on Saturday, 28 December. "I had an opportunity to reassess my options and once I spoke to Leeds it was a no-brainer to come back," Vickerman told BBC Radio Leeds. "I've had a fantastic time with the Sevens but I have a family to think about now so I don't want to be travelling all the time any more. "It will be an adjustment for me to get back into the 15-a-side game and the added physicality in the game just in the last three years is formidable."